As overreacting authorities busy themselves confiscating containers of deadly shampoo, deodorant, toothpaste and hemorrhoid cream from nervous fliers, an even greater danger lies right under their noses: what about laptop batteries? The US Consumer Product Safety Commission cites 339 instances of lithium and lithium-ion batteries "overheating, emitting smoke and fumes or exploding since 2003." Meanwhile, Dell responsibly reacts to the news of its laptops catching on fire (see photo above) with a huge recall involving multiple millions of lithium-ion battery units, while at the same time multiple thousands of these batteries are still flying in airplanes as you read this. That recall may not happen soon enough. 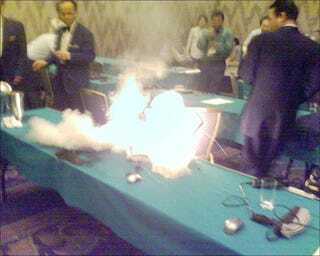 Note to TSA and Dell: "Dude, you're getting into a fiery plane crash."